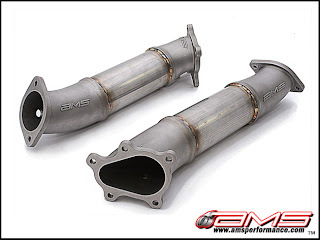 Home > AMS > 20 hp Gain with AMS Cast Downpipes . 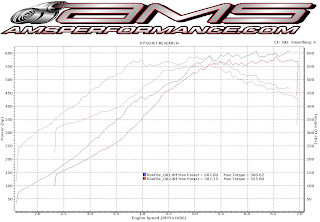 AMS Performance posted up a dynochart comparing a car with mods and stock downpipes to an AMS cast downpipe. They had some pretty impressive gains in spool up time, and horsepower. Click though for Cast downpipes dynochart after the jump. The turbo's are spooling 500 rpm quicker and the mid range is just INSANE!!! Previously at 3500 rpm we were seeing about 10 psi of boost. With the downpipes we are now seeing 20! up top you can see a 25 - 25 whp gain just about EVERYWHERE! With just an exhaust system tuning you can get from up around 30-80hp increase. That is awesome and that delivers a lot of power to your car.